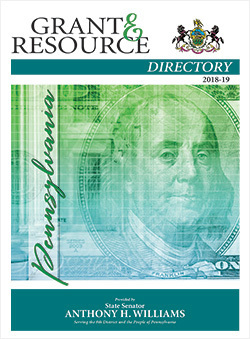 I am pleased to provide you with this copy of the Pennsylvania Grant Directory, which is intended to help you, local groups and residents find grants and other resources in government. From the Department of Aging to the state Treasury to the Pennsylvania Housing Finance Authority, the Pennsylvania Grant Directory is a great starting point for constituents and organizations seeking financial support for their work and ideas. Some state grant programs have limited eligibility in which only municipalities, school districts and nonprofit organizations can apply. And, it is important to note that some grant, loan and assistance programs change each fiscal year. It is best to check websites or contact the appropriate agency to learn about the current status of any program. If you need additional assistance, please contact my office.